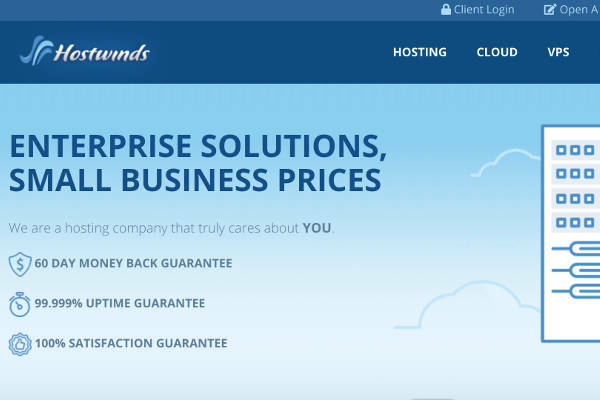 Hostwinds Hosting Review | Is This The Right Host For You? There is much hype around Hostwinds and their service; in this article we find out why. Hostwinds offer every type of hosting from VPS, Cloud and Dedicated to Shared and Reseller hosting. We take a closer look at each of these to find out the details and what’s on offer. We will cover client support, pros and cons, plan features before bringing everything together in our final verdict. Let’s answer the most urgent question; should you use Hostwinds hosting? Rated our Best Value for Money Host. Try Hostwinds! If functionality, reliability and customer service is what you are in the market for, then Hostwinds is for you. Their hosting plans are attractively priced, and with their variety of options they are sure to meet your needs. Let’s take a closer look at a few pros and cons. What are the Pros & Cons of Hostwinds? Money-back guarantee – Hostwinds provides a really good money back guarantee of 60 days. If you are not satisfied with their service, or would like to give it a trial, you will have 60 days to do so. Pricing – Unlike many of their competitors who display their plan price at the longest available period, the price displayed on the Hostwinds website is the price whether you opt for a 1 or 3 year contract. Trendy Tools – Included in each hosting plan is a website builder called Trendy Tools. There are several theme templates on offer which allow you to easily set up your website. You are able to drag and drop text, images and change color schemes. One more plus is that Trendy Tools allows for custom code which definitely creates a more custom look. Magento ecommerce – The ecommerce app can be found in the Softaculous library which easily allows you to create an online store. With their easy drag and drop store builder anyone can create an attractive online store. Marketing credits – In order to drive traffic to your newly designed website, Hostwinds includes $100 Google Adwords credits and $100 Yahoo/Bing advertising credits to each account. This is a great way to get traffic onto your site and really kickstarts your online presence. Free site migration – It doesn’t matter if you began your online journey with Hostwinds or not because site migrations are free. Their helpful team will transfer your website files for free and keep your site live in the meantime. Windows server – Hostwinds does not have a windows server option in every package. This can be a difficulty if you have a website which needs specific windows applications. Capping limitations – The hosting world has recently changed the wording of their plans from unlimited to unmetered. Issues may arise with bandwidth and disk space limitations being lower than expected. What hosting plans and features does Hostwinds offer? Hostwinds provide six types of hosting. These six are made up of Shared , WordPress, VPS, Cloud, Dedicated and Reseller hosting. Shared hosting – Hostwinds provides a low cost solution to users who do not require much resources. These plans allow users to share resources with others in an attempt to offer hosting solutions to entry-level websites. WordPress hosting – To cater to those users who prefer the WordPress content management system, Hostwinds provide WordPress optimized plans. You can easily install WordPress on their regular servers as well as their WordPress optimized ones. VPS Hosting – If you require more power, speed and performance than shared options, then VPS hosting is for you. Hostwinds has ten tiers of VPS hosting on offer which are sure to meet your needs. VPS hosting still shares server resources with others, but on a lower scale. This makes it faster, safer and more reliable. Cloud hosting – Hostwinds has several cloud hosting plans available. Cloud hosting, unlike traditional hosting which relies on resources from one server, draws CPU, RAM and other resources from several servers. Because resources are spread over several servers, Cloud hosting offers more reliability because if one server is down, it will reroute to one which is online. Dedicated hosting – Dedicated hosting is the most powerful hosting option available. These plans dedicate one server for your use, this means you are able to access the full power, memory and resources of that server. This option is also the most secure as you have full control over your environment. What is Hostwinds' Customer Service like? Hostwinds offer four lines of support; telephone, live chat, email/tickets and their knowledge base. All support teams are said to be available 24/7, however this is not completely accurate. All lines may be available, but not all departments. Technical support for common website issues for example is available 24/7, but the accounts department is not, they follow normal PST working hours. Let’s take a closer look at the different lines of support. The chat support is very fast, response times are typically within a minute or two. In terms of knowledgeable responses, it depends on the question. We’ve found that if you have common website issues, the staff are well equipped to answer your questions, however, if you have specific questions about the plans they offer, or differences between them you’re going to run into difficulties. The phone support is always slightly more personal and hence usually the more preferred line of communication. Telephone support at Hostwinds is really good with their staff being very professional and usually able to solve issues. The ticket support is at best, slow. With around a 12 hour waiting time to receive help and usually several tickets needed to solve more technical problems, be sure to be patient. Hostwinds offers a variety of great hosting options at very competitive prices. From Shared hosting, VPS, Cloud, dedicated or reseller hosting, Hostwinds will have a competitive deal for you. We feel that their VPS hosting is especially good, with so many plans on offer they really do cater to an abundance of needs and budgets. Their dedicated hosting plans are also very attractive because of the value they include. In terms of shared hosting our recommendation is that better deals are available from competitors. iPage is attractive if you are looking for price and SiteGround if you were looking for value.